January 12 Challenge (Week Three) - Add an envelope from your mailbox. I love that UPS uses brown envlopes for billing so I chose one for my challenge. The background of my page is a piece of scrap watercolor paper I used when making mono prints. I punched a little tab from my artwork and stapled it to the edge of the envelope opening. I also stitched the envelope before adding it to the page. 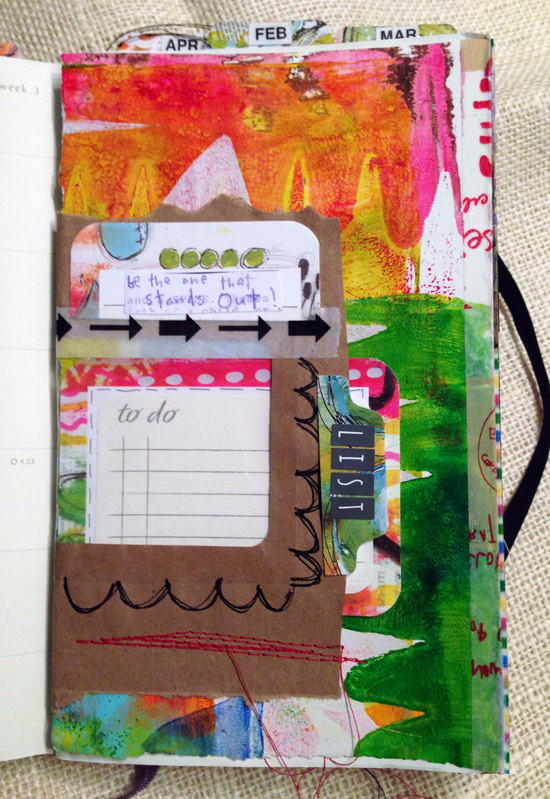 Add a little washi tape, doodles and sticker letters and all set. The envelope serves as a pocket for a small little to do list. I glued the list onto one of my Lo's Serendipity Art Pops™ cards and inserted it into the opening. I finished off the envelope with another Art Pops™ card from the same set, washi tape and a little quote from Art Bits Set #2 Digital Elements by me Samantha Kira Harding.